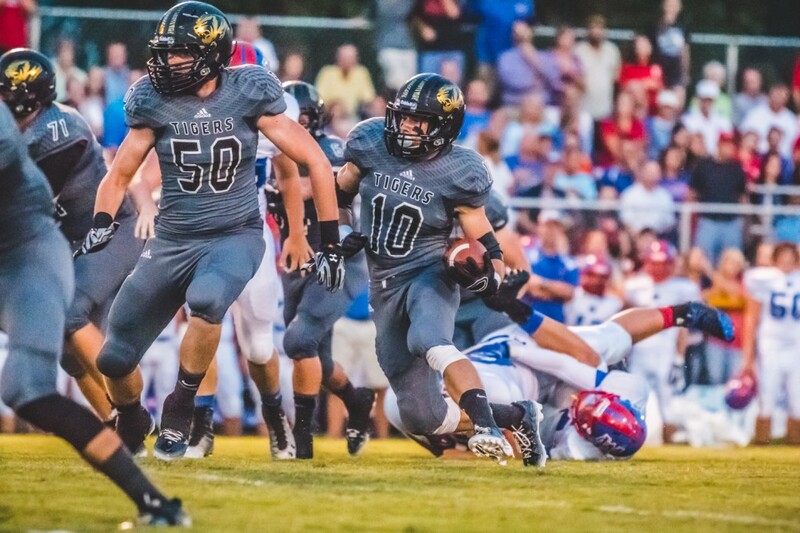 Friday, August 23, the Warren County High School Pioneers came to DeKalb County to take on the Tigers. 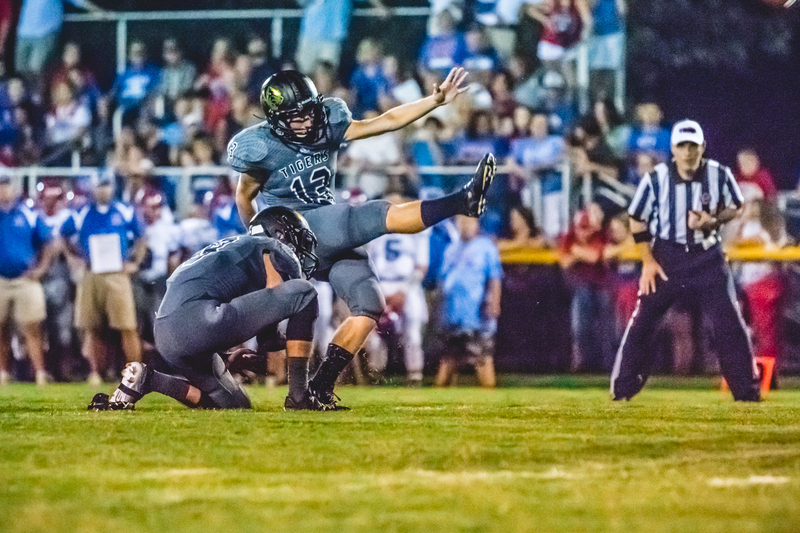 DeKalb County received the opening kick, an onside recovered by Drew Castorena at the 30-yard line. 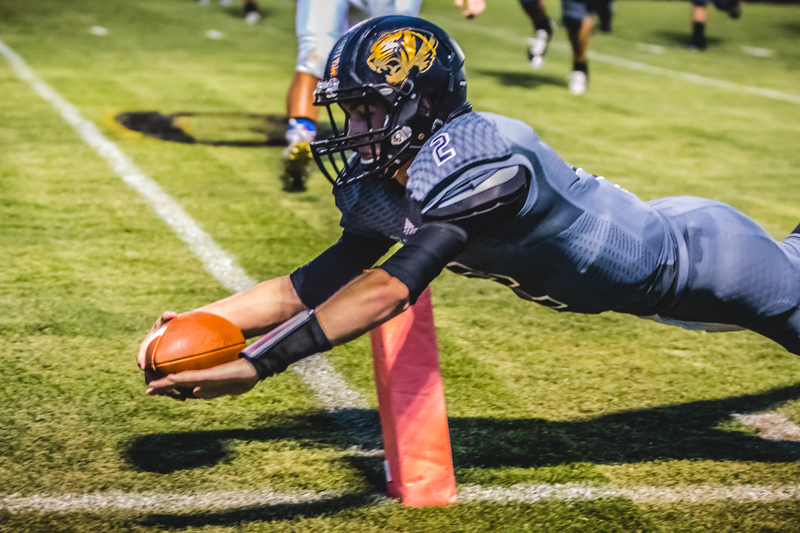 A throw to AJ Mooneyham, a handoff to Luke Boss, and two quarterback keepers by Steven Jennings later, the Tigers were in the endzone. The extra point put the Tigers ahead 7-0. 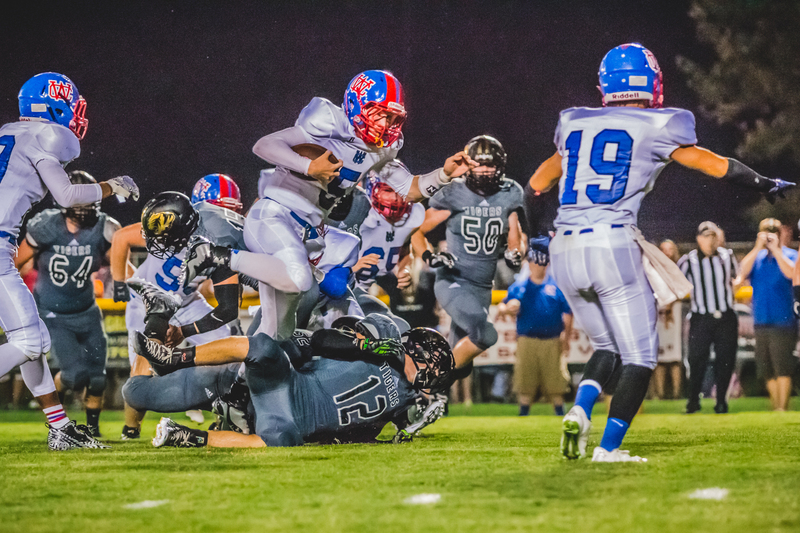 Steven Jennings leaps into the end zone. Warren County could not respond with their first possession of the game. A holding penalty on second down put them back at their own nine yard line with a long way to go for first down. Two complete passes brought them back to the 20 for fourth and ten. They punted, and DeKalb County took over on the Warren County 47 yard line. Three unfruitful plays made things look dismal for DeKalb County, but an unsportsmanlike conduct call on the Pioneers gave DeKalb a first down from the Warren County 35 yard line. 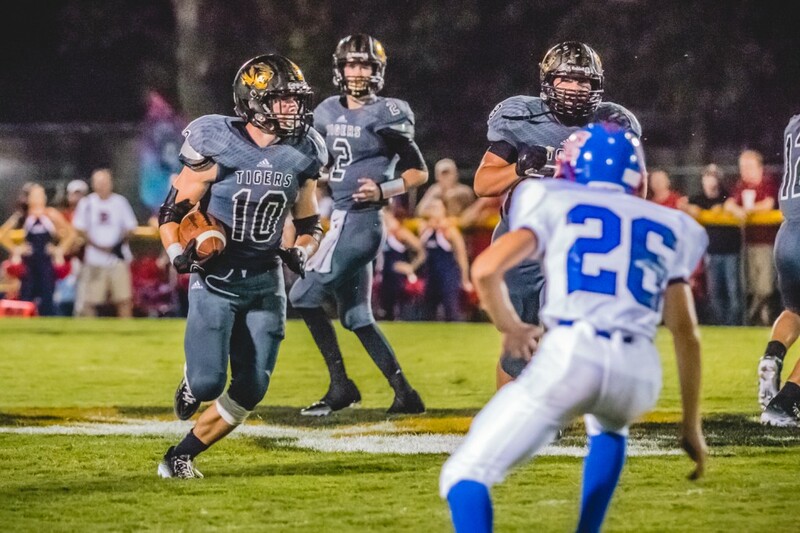 The Tigers fought their way to the Warren County 16 over the next seven or eight plays, and kicker Matthew Poss came in to put the Tigers ahead 10-0. Warren County was warmed up now, apparently. Their next drive began at their own 22 yard line. They started marching steadily down the field. Eight and four yard runs by Bryson Lewis gave the Pioneers a first down at the Warren 34. 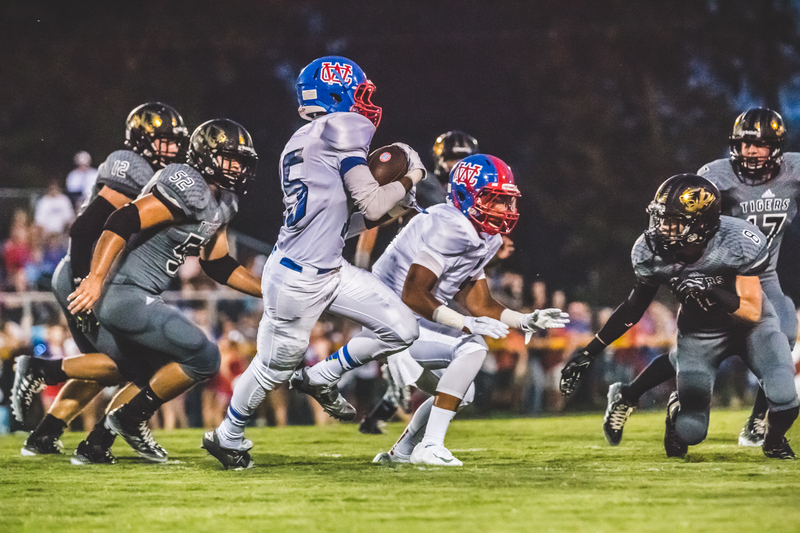 Malike Ladet carried the ball two more yards, then the quarterback connected with Adrian Lusk for sixteen yards, Ladet on a pass for 12 more yards, and Bryson Lewis carried the ball 30 yards down to the Tiger 6 yard line. A quarterback keeper put the ball in the end zone to put the Pioneers on the scoreboard, Tigers 10, Pioneers 7. DeKalb County snapped the ball twice before the first quarter ended. On a third and seven at the Warren County 43, Jennings hit Munoz for 27 yards, bringing the Tigers to the Pioneer 16. Jennings then carried the ball for two plays in a row to put the ball in the end zone, pushing the Tigers ahead 17-7. Another flag against Warren County on the kickoff started them off at their on ten yard line. They fought for four plays to make it to the 28. Then Bryson Lewis took the ball on a 72-yard run to the Tiger end zone to level the score a bit—Tigers 17, Pioneers 14. 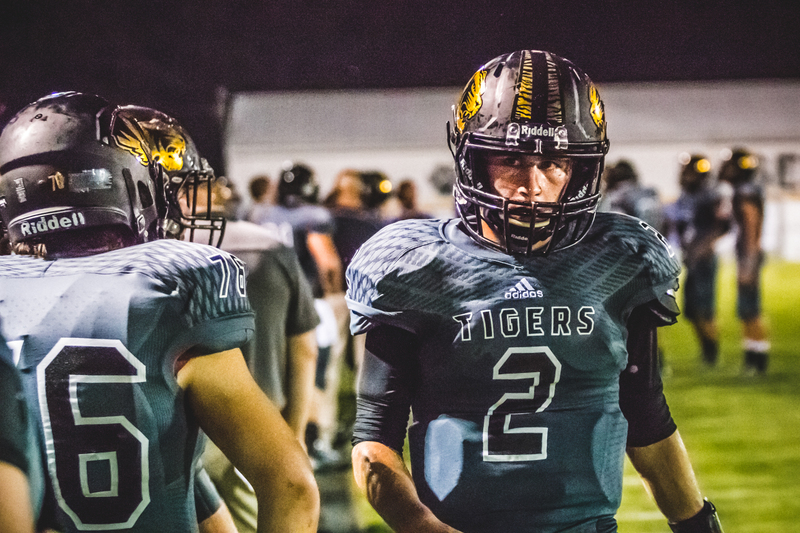 On the Tigers next possession, Steven Jennings, Luke Boss, and Aaron Patterson combined to march steadily from the Tiger 24 yard line to the Pioneer 40 in about 6 plays. But a holding call against DeKalb on first and ten would put them back at the fifty. Then two unfruitful plays would leave them facing fourth and seven, and Matthew Poss would come in to punt. On Warren County’s next drive, they marched quickly down the field with passes to Malik Ladet and Adrian Lusk, as well as Ethan Fliss. On first and ten from the Tiger 14, Ladet caught a pass and took it in for a touchdown, putting the Pioneers on top—Warren County 21, DeKalb County 17. DeKalb began their next drive with 22 seconds on the clock remaining in the first half. They would get one play off before the buzzer rang, ending the half with the Pioneers leading the Tigers. The remainder of the game was dominated by Warren County. They received the kickoff in the second half and marched 80 yards, 60 of which was earned by Rickie King on a handoff that ended the drive in the Tiger endzone, making the score Pioneers 28, Tigers 17. The Tigers progressed well for several plays from their own 38 to the Pioneer 46 yard line, but on second down and eleven to go, Jennings tried to connect with Drew Castorena, but it was caught by Warren County’s Ethan Fliss. The Pioneers would drive to DeKalb’s 32 yard line, but two flags against the Pioneers would put them back on DeKalb’s 43. An incomplete pass left them with fourth and fourteen. They punted, and the ball rolled out of bounds at DeKalb County’s 7-yard line. The Tigers then made a valiant effort. Jennings carried the ball eleven yards for a first down. He then threw to Patterson for 39 yards into Pioneer territory. 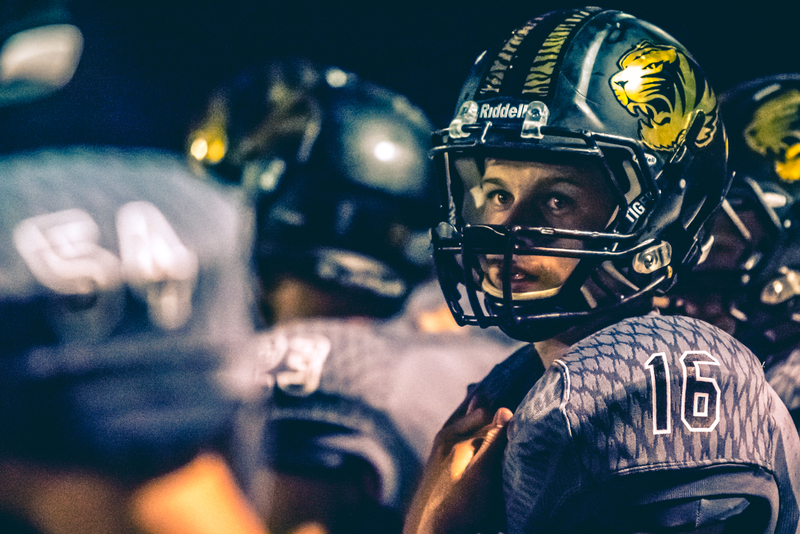 Boss carried it three yards, then eleven yards to put the ball on the 29.Two incomplete passes left the Tigers facing 3rd and 10. Jennings carried the ball 7 yards himself on third down, then tried again on fourth, but didn’t get anywhere. Warren County took over on their own 22. Jordan Bonner carried the ball eight yards, Bryson Lewis three, then Rickie King ran for 20 yards. After a delay of game penalty, King then ran it another five yards, followed by a 17 yard quarterback keep. King then drove another 6 yards over the next two plays, but fumbled on the second and the ball was picked up by DeKalb. DeKalb then drove from their own 19 yard line to the Warren 44, but a pass intended for Austin Brown was picked off by Warren County’s Adrian Lusk. A flag called on DeKalb County at the end of the play started Warren on the DeKalb 38 yard line. On fourth and four, a pass to Adrian Lusk brought the ball to DeKalb’s 18 yard line, getting the Pioneers a first down. On third and one, a false start was called against the Pioneers. 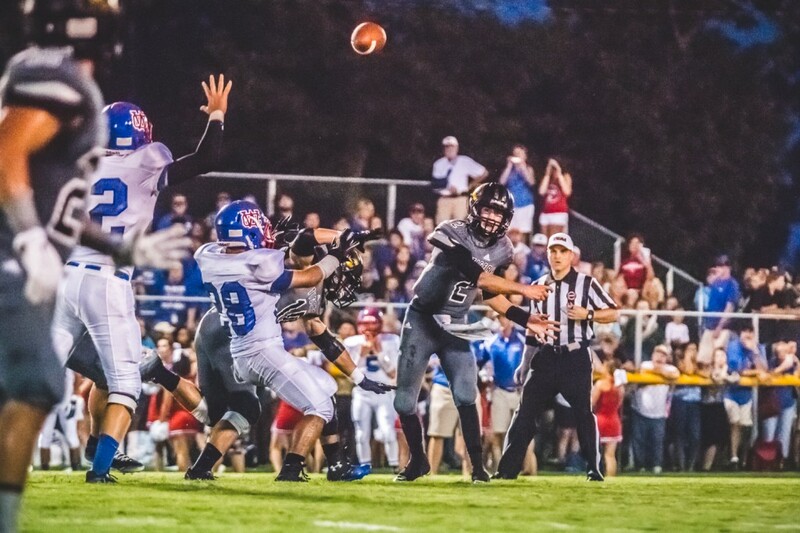 Then it was third and 6, when offsides was called against Warren County. On third and eleven, a flag was called on DeKalb during the play, and Warren County would have first and goal at the DeKalb four. This time, false start was called on Warren County again. First and goal from the DeKalb 9. A quarterback keep would bring it to the five. A delay of game call pushed it back to the ten. Finally, the quarterback ran it in for a touchdown with three and a half minutes remaining in game time. 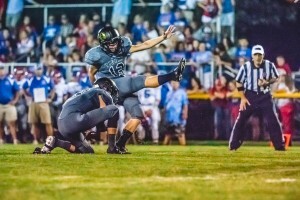 DeKalb County blocked the extra point, making the score Pioneers 34, Tigers 17. When DeKalb got the ball, Jennings began with an eight yard quarterback keep run to the DeKalb 42 yard line. Two plays later, a pass to Austin Brown brought the ball to midfield. Jennings ran another 6 on first down, threw the ball away on second, connected with Boss for four on third down to gain the Tigers a first down. Three incomplete passes made it fourth and ten, but Patterson would catch the ball on fourth and gain the Tigers 12 yards and a first down. From the Pioneer 28, Jennings threw the ball to Munoz on the next play for a touchdown, bringing the Tigers up 7 more—Tigers 24, Pioneers 34. The onside kick went out of bounds, and the Pioneers began on their own 40. A couple of flags and some unsuccessful plays caused Warren to punt on fourth down. DeKalb took over with 33 seconds on the clock. 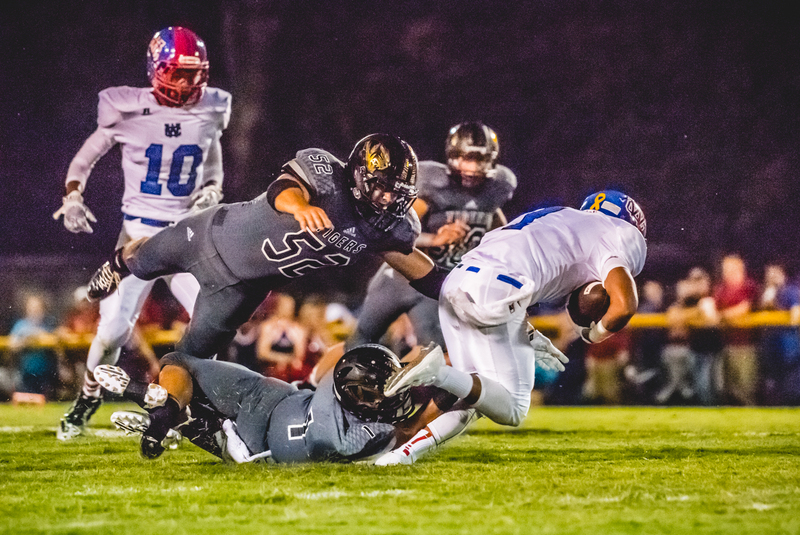 In five plays, they managed to get the ball into the end zone for one last touchdown, softening the sting for the final score: Warren County 34, DeKalb County 30. Next Friday DeKalb County is scheduled to play Stone Memorial at home. The game begins at 7:00.